Tears are a clear fluid that serve to moisturize the outer parts of the eye, prevent invasion of the eye tissue by any microorganisms, wash away any dirt and debris that can irritate the eye and provide lubrication for the movement of the eyeball against the eyelid. It is composed of the secretions of three different glands associated with the eye and forms a thin film over the exposed area of the eye. The quantity of tears is balanced by sufficient yet not excessive tear production and secretion and adequate drainage of the secreted tears. However, any disruption in secretion or drainage can lead to an excess or deficiency of tears leading to watery eyes or dry eyes respectively. Epiphora is the overflow of tears associated with excessive production and/or inadequate drainage. It is not uncommon to experience an overflow of tears with excessive tear production in certain instances like emotions, crying, yawning, vomiting and irritation to the eye. In these cases the excess of tears is short lived passing within minutes and does not cause any ongoing problem. However, with epiphora the excess of tears in the eyes is continuous and most cases are associated with a blockage of the tear drainage system. Depending on the cause, it may also be associated with itching of the eyes, burning, pain and/or redness of the eyes. The main component of tears is lacrimal fluid secreted by the lacrimal gland. It is a thin watery fluid laden with certain proteins and enzymes that help protect the eye. Small amounts of mucus and oils come from the mucus-secreting goblet cells of the conjunctiva and meibomian glands at the edge of the eyelids respectively. Lacrimal fluid is passed out of the lacrimal gland between the eyeballs and eyelids. It is then spread over the eye by blinking. The fluid is then drained by entering into the lacrimal canal through the punctum and then passes into the lacrimal sac. It is gradually drained via the nasolacrimal duct into the nasal cavity. Abnormal and excessive tearing is the main feature and this can be mild or reach the point where the overflow causes tears to run down the cheeks. 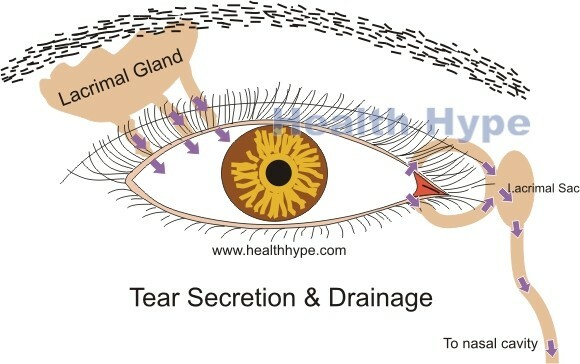 Sometimes there is a discharge that can be more like mucus or pus compared to the normally thin and clear tear fluid. Crustiness of the eyes are also more likely with a mucoid or purulent discharge. In rare cases there may even be blood. The eyes may appear red and puffy. Sensations when present may vary from burning to pain or an itchy feeling. Temporary blurred vision may also be present as a result of the tears affecting normal light entry and refraction. There may be tenderness around the eye and even a painful swelling at the inner canthus (corner of the eye next to the nose). Since the tears drain into the nasal cavity, a runny nose is often present if the there is no obstruction of the drainage system. A bloody nasal discharge (epistaxis) may also be a possibility and is more likely to be associated with cancer. It is important to differentiate between excessive tear secretion and inadequate tear drainage. Excessive tear production and secretion can be associated with a number of acute and chronic causes. Conjunctival and eyelid irritation is one of the more common causes associated with excessive tearing. It is typically acute and can be associated with infections, injury, mechanical (usually ingrown eyelashes) or chemical irritation and allergies. Usually the cause is obvious or the presentation and modalities of the condition is such that it indicates the most likely cause. It is important to remember that these same causes when affehttps://www.healthhype.com/wp-admin/post.php?post=19096&action=editcting the nasal cavity and paranasal sinuses may also lead to excessive tearing. More chronic causes may be associated with injury to cranial nerve V, persistent inflammation of the eyelids (blepharitis) and conjunctiva (conjunctivitis), anatomical abnormalities of the eyelid (like ectropion or entropion) and various chronic causes of eye dryness. A foreign body is more likely to be acute in nature but if left undetected, it can give rise to persistent watery eyes. The more common cause, however, is an obstruction of the nasolacrimal duct thereby preventing normal drainage of tears. While the causes may to some extent overlap with with excessive tear production, it does warrant further discussion. Nasolacrimal duct obstruction (NLDO) may be primary or secondary. It is then termed primary acquired nasolacrimal duct obstruction (PANDO) or secondary acquired lacrimal duct obstruction (SALDO). PANDO is due to inflammation of the nasolacrimal duct that occurs for unknown reasons and is not related to underlying diseases. Persistent inflammation leads to fibrotic scarring of the tissue thereby resulting in narrowing or even obstruction of the duct. Secondary acquired lacrimal duct obstruction (SALDO) may be due to infections, trauma including previous surgery, foreign bodies within the duct, external compression on the duct, various inflammatory causes and tumors. The choice of treatment depends on the underlying cause. Mild cases may not require any treatment. Infections can be treated with a number of topical and systemic antimicrobial agents. Antihistamines and corticosteroids may be required for allergies and other inflammatory causes. Surgery may be indicated depending on the cause. A dacryocystorhinostomy is a surgical procedure to restore tear drainage from the lacrimal sac into the nasal cavity when then nasolacrimal duct is blocked.